Open the microwave door to show what’s cooking at your party. Great theme for a bridal shower --kids parties, too! Custom print your own details on the invitation, and take photos of your guests to add to the dinner plate thank you cards. This listing is for an “Eti-Kit”—a DIY kit that comes with software to easily print on the card so you don't have to hand write them all yourself! Includes all materials: pre-printed paper, CD with instructions and printing template, and envelopes. Makes 10 invitations and thank you cards. BONUS! Free printable PDF to make your own guest book. Pass it around during the party and let guests add a bit of advice or their favorite recipe. After, personalize each page with a photo of the guests. 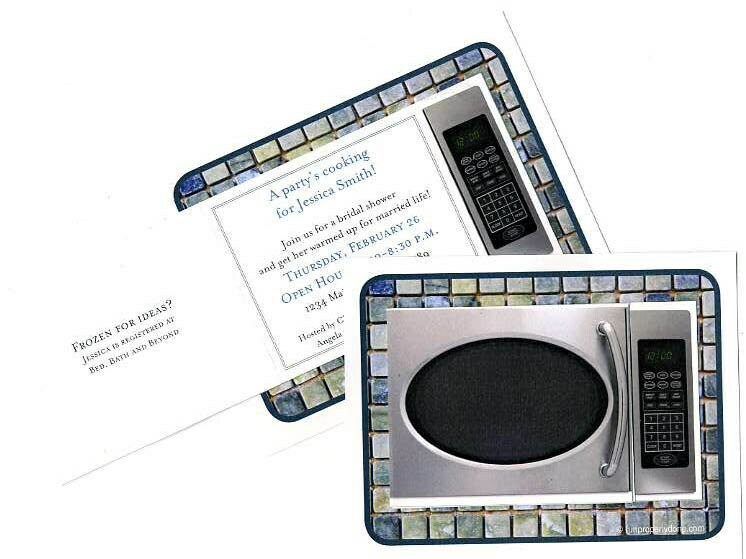 A thoughtful gift for the bride-to-be or a funny keepsake of kids' original recipes. Need more than 10? Just want a PDF to print your own invitations? Contact me via Etsy. Printable PDF is $5.